The first weekend in June, the 1st through 3rd, Fishing For Our Troops will be down at the Virginia Beach Oceanfront/Boardwalk to support the USO Warrior Week. USO Warrior Week is a time for wounded, ill, and injured members of the military to come together and participate in a multitude of different events to assist in their recovery. The USO is partnering with many different organizations, including FFOT, to bring a variety of therapeutic and recreational events to Virginia Beach for veterans and active duty military to participate in. Each day of the weekend (1st through 3rd), FFOT will be at the boardwalk raising awareness and funds for the USO, as well as raffling a few RPM fishing rods. On Friday, June 1, FFOT selected pro bass anglers will be taking a group of veterans and active duty military out on the water for a day of fishing. 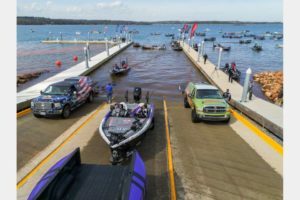 They will have an opportunity to hear the best strategies and tools used for bass fishing, fish alongside pro bass anglers, and have an all around fun day on the water. If you are a veteran or active duty military member and would like to participate in this event, please contact the Hampton Roads USO. Note – there is a limited number of participants allowed to register. See our calendar of upcoming events for other opportunities. Click here if you’re interested in donating and here if you’re interested in volunteering with an upcoming event.